To be evaluated by the USAF alongside the Northrop P-600, the General Dynamics Model 401 is the subject of a two-prototype contract, interesting features revealed by this general arrangement drawing including the ventral engine air intake, the wing root leading-edge extensions, and the position of the single M-61 rotary cannon. The eleventh pre-production Grumman F-14A Tomcat (157990) performed compatibility trials at Norfolk, Virginia, recently aboard the USS Independence (CVA-62). This provisional general arrangement drawing illustrates the major external features of the Northrop P-600, two prototypes of which have been ordered for the USAF to define capabilities of the lightweight fighter concept. The P-600 emplays most of the aerodynamic features of the projected P-530 Cobra multi-role fighter but weights considerably less with a gross weight of 19,600 lb (8 890 kg). The first of two Northrop YA-9A close air support prototypes, illustrated here, was scheduled to make its first flight at Edwards AFB last month (May) of 1972, and will participate in a fly-off against the competing Fairchild YA-10A. The YA-9A is claimed to be capable of meeting the USAF ceiling price (based on a buy of 600 aircraft at 1970 values) of $1.4m per unit. A more militant derivative of the MFI 15, the Saab MFI 17 light close-support aircraft commenced its flight test programme recently, and made its public debut at Hanover in April 1972. Claimed to offer a cost-effective weapon delivery system, with low initial purchase price and minimal operating costs, the MFI 17 can carry up to 661 lb (300 kg) of ordnance on six underwing attachment points. Typical loads include four Abel pods each containing seven 2.75-in rockets, six Bantam anti-tank missiles, or 18 Bofors 7,5-cm rockets. Power is provided by a 200 hp Lycoming IO-360-A1B6 engine. Latest artist's impression of the Northrop F-5E Tiger II shows the revised wing root leading-edge extension. 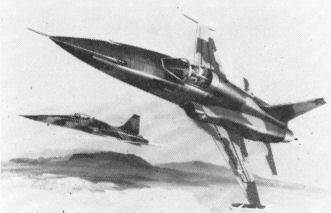 The first F-5Es are scheduled to be delivered to the USAF Tactical Training Squadron at Williams AFB, Arizona, in February 1973.